Saint Michael is an archangel who as a spiritual being has the ability to communicate between God and humans. Saint Michael, meaning “Who is like God?” is known as a prince and captain-general of the host of heaven. His name was the war-cry of the good angels in the battle fought in heaven against Lucifer and his followers, the fallen angels. He is charged with fighting against Satan, rescuing the souls of the faithful from the power of the Devil, especially at the hour of death, to be the champion of God’s people; the Jews and Christians and to bring men’s souls to judgment. 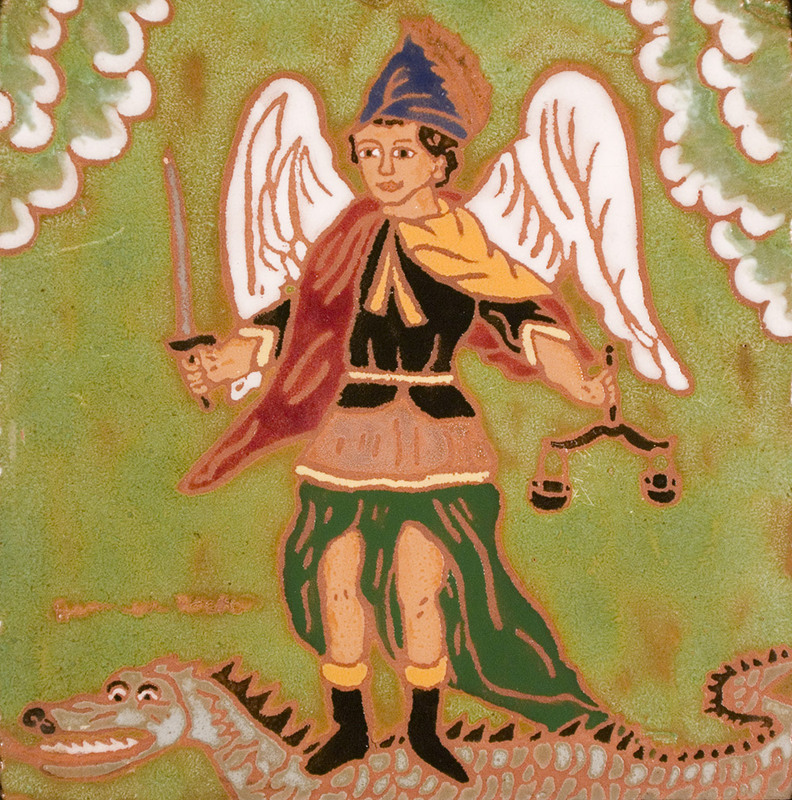 In this modern tile piece he is portrayed standing on the dragon which symbolizes his victory over the enemies of God. As written in Apocalypse 12:7, “And there was a great battle in heaven, Michael and his angels fought with the dragon.” In his right hand he holds his sword and in the left he holds a set of scales. The scales show that he has the capacity to weigh men’s souls. Saint Michael is the patron saint of grocers, mariners, paratroopers, police and the sick. He is invoked in times of temptation and at the moment of death.